Look for the man in the Orange & White Van! Call to get your Air Conditioner Cleaned & Checked Now! Putnam County Board member steps down Putnam County Board member Willie Holmes resigned his seat, effective immediately, near the end of the board’s April 8 meeting. Holmes is pictured reviewing the county’s yearly financial audit at that meeting. SEE COUNTY BOARD STORY ON PAGE 7. GRANVILLE — Putnam County Schools Superintendent Carl Carlson has been fielding numerous inquiries about the April 2 Putnam County School Board election results. There has been some confusion in regard to current Board President Jim Gibson’s race. While Gibson received the lowest amount of votes, he ran unopposed and therefore retains his seat. Emily Chiado was unopposed and won from her township. Adriane Shore defeated Gretchen Currie, who challenged from the same township. Michael Borri defeated Jason Judd to be elected to the remaining two years of an original four-year term. Membership on the board is restricted to a maximum of three members from any congressional township. The area of residence of those elected to fill unexpired terms is taken into consideration in determining the winners of the full terms. for Maintenance done on your Tractor before the season starts! Correction On the front page of the April 10 issue of the Putnam County Record, Kyle Fogle was incorrectly identified as an IVCC student. Fogle is an instructor at the college. The Putnam County Record regrets the error. 95 service call to come to your ﬁeld! Check out our new Website! siegtire.com Where We Always Keep You Rollin! on April 6 and questioned by police. According to a press release, Mentgen was picked around 1 a.m. April 6 by Wisconsin State Police after an Illinois Department of Corrections arrest warrant was issued for parole violation. While Mentgen was being held in the Dane County Jail in Madison pending extradition, Spring Valley officers traveled to Wisconsin April 6 to interview him. Police have not released any further details on Mentgen at this time. 4 Let’s take a video! 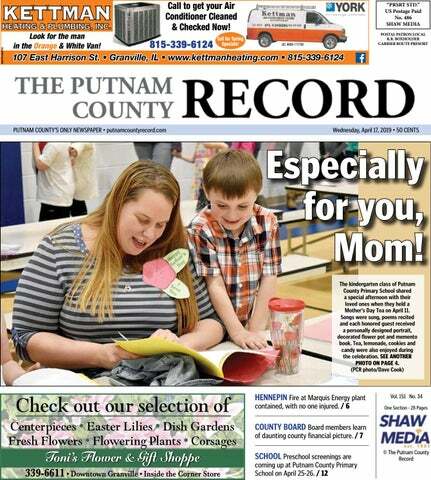 The video recorders and smartphones were out and in use as moms and loved ones watched kindergarten class members at Putnam County Primary School sing songs and recite poems during a special Mother’s Day Tea on April 11. Each honored guest received a personally designed portrait, decorated flower pot and memento book. Tea, lemonade, cookies and candy were also enjoyed during the celebration. IN BRIEF Scam alert from the Illinois Sheriffs’ Association The Illinois Sheriffs’ Association advises all Illinois county residents that there is currently underway a phone campaign fraudulently using the name and phone numbers of the Illinois Sheriffs’ Association. in Grundy County. His most recent prison stint was due to a cocaine drug offense. In 1999, Mentgen’s record shows he served time for escaping the department of corrections in Cook County. The homicide incident in under investigation by Spring Valley Police Department, Bureau County State’s Attorney’s Office, Illinois State Police Crime Scene Services and the Bureau County Coroner’s Office. number of the telemarketing firm. 3) The percentage of every dollar paid to the telemarketing firm. 4) Insist on something in writing prior to making a pledge or commitment. If you cannot get the answers to these questions, do not hesitate to hang up the phone. After all, it is your money. ation never solicits by phone. Should you receive a call from someone saying they represent your local sheriff or the Illinois Sheriffs’ Association and are asking for donations, contact the Sheriff’s Office immediately or gather as much information as you can from the caller and report it to the Illinois Sheriffs’ Association at ISA@ilsheriff.org. We are here for all your lending needs! Motorists entering or leaving Hennepin on the afternoon of April 8 witnessed a large controlled burn in the field between High Street and Old Highway 26. The flames were reminiscent of prairie fires that swept the Prairie State during pre-settlement days. Nine area fire departments and ambulances from three area ambulance services responded to the April 10 fire in a building at Marquis Energy’s Hennepin ethanol plant. The fire that had spread through multiple levels in a building at the plant’s south unit was quickly contained, and no injuries were reported. efforts,” Danielle Anderson, director of public relations and political affairs for Marquis Energy, said. Anderson also re por ted the plant’s north unit continues to run at full capacity. The cause of the fire has yet to be released. The Marquis Energy ethanol plant produces roughly 1 million gallons of ethanol each day. Have your air conditioner checked & cleaned or replace that old unit with an efﬁcient Goodman Air Conditioner! independent auditor, Arch Hopkins & Associates January. We have to start thinking about how we’re going to address this,” she said. “We can’t keep doing this,” Luke Holly, acting board chairman, said. Auditor’s assessment Bird’s assessment of the county’s financial prospects made the situation seem even more dire, citing “weakness” and “significant deficiencies.” She said the combination of decreasing revenues and increasing liabilities resulted in the county overspending by approximately $230,000 last year. She added the cost of salaries, insurance and benefits will always be the county’s largest expenses. Despite the county making spending reductions in several other areas, Bird said, “It’s just not enough.” She said over the past five years, property tax revenue has increased five percent, but both sales tax revenue and revenue from fees and fines have decreased. State reimbursements have remained level. “The train has come around the bend, and this is what we’re looking at. We’re going to have to start asking harder questions and making more difficult decisions,” board member Charlie Lenkaitis said. Bird recommended the board adopt new practices to have a more thorough understanding of the county’s financial situation. “You need to have a clear cash balance at the end of the year. Otherwise, you’re just guessing,” she said. She also said that rather than just “approving the bills,” the board needs to document each expense paid, month-by-month, so nothing is overlooked. “The county also needs a long-term plan, for five years, to know where the county is going, rather than for just one year,” Bird said. the county could be significant. “A parent is both financially and morally responsible for their child,” she said, adding that her office makes every effort to work with families to find both appropriate and affordable solutions for their individual situations. County highways Susie Simmons reported on behalf of Pat Sloan, county engineer. She said rising oil prices have caused the bids for the upcoming season of road work to surpass township estimates. She said most bids throughout both Marshall and Putnam counties have come in between 1 and 8 percent higher than expected. Granville Township received a bid 21 percent higher than estimated and chose not to pursue the project. Instead, the township would use those funds to help meet the increased costs of another project. Senachwine Township has $57,000 worth of road projects planned, Magnolia Township has $80,000, Hennepin Township has $64,000 and Granville Township has $56,000. 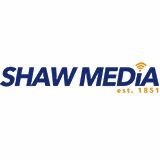 The board tabled approval until its May meeting in hope of discussing it with Sloan. Simmons also said an electronics collection event will be held from noon to 6 p.m. on April 26 at the municipal building on Railroad Street in Toluca. Use of building The board tabled Sheriff Kevin Doyle’s request that the non-profit Braveheart — Children In Need organization be allowed to use the Office of Emergency Management building. The Braveheart organization helps children who have been removed from their homes because of abuse, neglect or both. Doyle said the group would typically need the building only a couple of times a month for a few hours at a time and wouldn’t require anything additional. In other items • Board member William Holmes resigned his seat, effective immediately. The Putnam County Democratic Central Committee will put forth a nominee to fill the vacancy. • The board approved amending the Enterprise Zone ordinance to include an additional 18 acres to encompass expansions at the Van-Packer company in Buda and the Kasbeer Farmers Elevator Co-op in Kasbeer. These additions won’t have any effect on Putnam County finances since they are both located in Bureau County. • Putnam County Zoning Officer Jim Burger reported the demolition at the steel mill site is moving forward and that, despite appearances, is well organized. The many piles of debris on the site are each made up of different grades of steel. • The next Putnam County Board meeting is scheduled for 5:30 p.m. on May 13. JOSEPH ‘JOE’ ELY SPRING VALLEY — Joseph “Joe” Ely, 57, of Spring Valley passed away on Tuesday, April 9, 2019, at his residence. Joe was born Aug. 9, 1961, in Spring Valley to Charles and Rita (Merdian) Ely. He married Nancy Morris on Oct. 10, 1987, in McNabb. He graduated from LaSalle-Peru High School. Joe worked in maintenance for the city of Princeton for 20 years, where he mowed the cemeteries. One of his hobbies was tractor pulling. Joe was a hard worker. He enjoyed spending time with family and was lovingly called Papa by everyone. Surviving are his mother, Rita Ely of Putnam; his wife, Nancy Ely of Spring Valley; three daughters, Connie Ely, Katie Ely and Sara Ely of Spring Valley: four brothers, Steve (Laura) Ely of Dixon, Dave Ely of Putnam, Bill Ely of Putnam and Kevin (Debbie) Ely of Granville; one sister, Charlene (Dave) Ryckaert of LaMoille; and two grandchildren, Sophie and Odin. He was preceded in death by his father in 1994 and one brother, Robert “Gus” Ely in 2018. Services were held Saturday, April 13, at the Dysart-Cofoid Funeral Chapel in Granville with Father Patrick DeMuelemeester officiating. Burial was in Riverside Cemetery in Hennepin. Visitation was held Friday, April 12, at the funeral home. In lieu of flowers, contributions may be directed to donor’s choice. Online condolences may be sent to his family at www.dcfunerals.com. seven grandchildren, Laurie Glenn of Magnolia, Tony (Dawn) Glenn of Magnolia, Jennifer (Rick) Garinger of Champaign, Tim Glenn of Henry, Andrew (Jennifer) Glenn of Magnolia, Krystal (Bart) Vaughn of Westmont and Megan (Alex) Tarr of Magnolia; nine great-grandchildren; two great-great-grandchildren; and her faithful companion, “Mackie.” She was preceded in death by her parents, her husband and one son in infancy. Services were held Saturday, April 13, at the Magnolia Methodist Church in Magnolia with the Rev. Jan Ringenberg officiating. Burial was in the Magnolia Cemetery. Visitation was held prior to the service. Pallbearers were Michael Glenn, Tim Glenn, Tony Glenn, Andrew Glenn, Derek Glenn, Jeremy Glenn, PJ Garinger and Rick Garinger. In lieu of flowers, contributions may be made to the Magnolia Methodist Church or Putnam County Ambulance. The Dysart-Cofoid Funeral Chapel in Granville assisted the family with the arrangements. Online condolences may be left at www.dcfunerals.com. Obituary deadline Please submit obituaries by 9 a.m. Monday for publication in Wednesday’s edition. Unique designs with the traditions of the past. We can duplicate any monument. Please contact us to assist you in designing your lasting tribute. Afﬁliated with Helmer Shields Funeral Home. Offering a full line of Granite Memorial Products. Marko’s in Mark is for sale now at $79,000. We are still Open Friday & Saturday from 5:00 P.M. to 9:00 P.M. We are still offering our same full menu at this time, including alcoholic beverages. We suggest you bring any gi� certiﬁcates in to be redeemed, as our target closing date will be on or near June 1st, 2019. Please call or check Facebook to keep current! We post every Friday & Saturday our evening specials! Our current asking price is now $79,000 as stated above. The Putnam County Real Estate Tax Bill (2018) Fair Tax Value: $96,850. Any inquiries can call and leave us a message at: 815-339-6577. We will return your call. Thank you for the 23 years! It is now time to change our life directions! GRANVILLE — Eileen Marie (Paganelli) Kelsey, 84, was called home on Thursday, April 11, 2019. She passed away peacefully at her son’s home in Granville, with her family by her side. Eileen was born Jan. 4, 1935, to Elvio and Nerina (Bernardi) Paganelli. She married Raymond Kelsey Nov. 29, 1952, in Sacred Heart Catholic Church in Granville. Eileen graduated from Hopkins High School in Granville. She loved gardening and visiting with her family. Eileen volunteered at Habitat for Humanity in St. Joseph County, South Bend, Ind., the Granger Food Pantry and at St. Joseph Memorial Hospital. Eileen made her home in Indiana for more than 50 years before returning to Granville in 2017. Eileen is survived by six children, Mike (Julie) Kelsey of Granville, Kathy (Terry) Eisenhower of Menford, Tenn., Karen (Jim) Campbell of Montgomery, Texas, Bob (Janet) Kelsey of Elkhart, Ind., Tom (Donna) Kelsey of Thompson, Ga., and Brian (Peggy Mechaelsen) Kelsey of Granville; 10 grandchildren; seven great-grandchildren; and a sister, Anna Gardner of Peru. Eileen was preceded in death by her husband, Raymond, and her parents. Services were held Tuesday, April 16, in the Helmer-Shields Funeral Home in Granville with Father Robert Spillman officiating. Visitation was held prior to the service in the funeral home. Cremation rites were accorded after the services. Memorials may be directed to Habitat for Humanity in St. Joseph County (South Bend, Ind.) or the Granger Food Pantry. Annual Water Quality Report for the period of January 1 to December 31, 2018 This report is intended to provide you with important information about your drinking water and the efforts made by the water system to provide safe drinking water. The source of drinking water used by MARKis ground water For more information regarding this report contact: Name: Michael Holmes Phone: (815) 343-9942 Este informe contiene información muy importante sobre el agua que usted bebe. Tradúzcalo ó hable con alguien que lo entienda bien. The sources of drinking water (both tap water and bottled water) include rivers, lakes, streams, ponds, reservoirs, springs, and wells. As water travels over the surface of the land or through the ground, it dissolves naturally-occurring minerals and, in some cases, radioactive material, and can pick up substances resulting from the presence of animals or from human activity. Contaminants that may be present in source water include: - Microbial contaminants, such as viruses and bacteria, which may come from sewage treatment plants, septic systems, agricultural livestock operations, and wildlife. Inorganic contaminants, such as salts and metals, which can be naturally-occurring or result from urban storm water runoff, industrial or domestic wastewater discharges, oil and gas production, mining, or farming. - Pesticides and herbicides, which may come from a variety of sources such as agriculture, urban storm water runoff, and residential uses. - Organic chemical contaminants, including synthetic and volatile organic chemicals, which are by-products of industrial processes and petroleum production, and can also come from gas stations, urban storm water runoff, and septic systems. - Radioactive contaminants, which can be naturallyoccurring or be the result of oil and gas production and mining activities. Source Water Assessment We want our valued customers to be informed about their water quality. If you would like to learn more, please feel welcome to attend any of our regularly scheduled meetings. The source water assessment for our supply has been completed by the Illinois EPA. If you would like a copy of this information, please stop by City Hall or call our water operator at (815)343-9942. To view a summary version of the completed Source Water Assessments, including: Importance of Source Water; Susceptibility to Contamination Determination; and documentation/recommendation of Source Water Protection Efforts, you may access the Illinois EPA website at http://www.epa.state.il.us/cgi-bin/wp/ swap-fact-sheets.pl. Drinking water, including bottled water, may reasonably be expected to contain at least small amounts of some contaminants. The presence of contaminants does not necessarily indicate that water poses a health risk. More information about contaminants and potential health effects can be obtained by calling the EPAs Safe Drinking Water Hotline at (800) 426-4791. In order to ensure that tap water is safe to drink, EPA prescribes regulations which limit the amount of certain contaminants in water provided by public water systems. FDA regulations establish limits for contaminants in bottled water which must provide the same protection for public health. Some people may be more vulnerable to contaminants in drinking water than the general population. Immuno-compromised persons such as persons with cancer undergoing chemotherapy, persons who have undergone organ transplants, people with HIV/AIDS or other immune system disorders, some elderly and infants can be particularly at risk from infections. These people should seek advice about drinking water from their health care providers. EPA/CDC guidelines on appropriate means to lessen the risk of infection by Cryptosporidium and other microbial contaminants are available from the Safe Drinking Water Hotline (800-426-4791). If present, elevated levels of lead can cause serious health problems, especially for pregnant women and young children. Lead in drinking water is primarily from materials and components associated with service lines and home plumbing. We cannot control the variety of materials used in plumbing components. When your water has been sitting for several hours, you can minimize the potential for lead exposure by ﬂushing your tap for 30 seconds to 2 minutes before using water for drinking or cooking. If you are concerned about lead in your water, you may wish to have your water tested. Information on lead in drinking water, testing methods, and steps you can take to minimize exposure is available from the Safe Drinking Water Hotline or at http://www.epa.gov/safewater/lead. Source of Water: MARK The Illinois EPA does not consider the source water of this facility to be susceptible to IOC, VOC, or SOC contamination. This determination is based on a number of criteria including: the land-use activities in the recharge area of the wells, the available hydrogeologic data, monitoring conducted at the wells, and monitoring conducted at the entry point to the distribution system. Lead and Copper Deﬁnitions: Action Level Goal (ALG): The level of a contaminant in drinking water below which there is no known or expected risk to health. ALGs allow for a margin of safety. Action Level: The concentration of a contaminant which, if exceeded, triggers treatment or other requirements which a water system must follow. Likely Source of Contamination Erosion of natural deposits; Leaching from wood preservatives; Corrosion of household plumbing systems. The following tables contain scientiﬁc terms and measures, some of which may require explanation. Regulatory compliance with some MCLs are based on running annual average of monthly samples. A Level 1 assessment is a study of the water system to identify potential problems and determine (if possible) why total coliform bacteria have been found in our water system. A Level 2 assessment is a very detailed study of the water system to identify potential problems and determine (if possible) why an E. coli MCL violation has occurred and/or why total coliform bacteria have been found in our water system on multiple occasions. The highest level of a contaminant that is allowed in drinking water. MCLs are set as close to the MCLGs as feasible using the best available treatment technology. The level of a contaminant in drinking water below which there is no known or expected risk to health. MCLGs allow for a margin of safety. The highest level of a disinfectant allowed in drinking water. There is convincing evidence that addition of a disinfectant is necessary for control of microbial contaminants. The level of a drinking water disinfectant below which there is no known or expected risk to health. MRDLGs do not reﬂect the beneﬁts of the use of disinfectants to control microbial contaminants. not applicable. millirems per year (a measure of radiation absorbed by the body) micrograms per liter or parts per billion - or one ounce in 7,350,000 gallons of water. milligrams per liter or parts per million - or one ounce in 7,350 gallons of water. A required process intended to reduce the level of a contaminant in drinking water. Water additive used to control microbes. By-product of drinking water disinfection. Erosion of natural deposits; Runoff from orchards; Runoff from glass and electronic production wastes. screening will be used to determine eligibility for the early childhood program at the primary school. Students not eligible will be placed on a waiting list until after the August screening. The preschool program (Preschool for All) is a state-funded grant program from the Illinois Board of Education, and all rules and regulations are followed for the grant support. The program offers developmentally appropriate experiences for young children to strengthen their skills for success later on in school. It includes hands-on activities presented in a positive and encouraging learning environment. Parents interested in making an appointment for the preschool screening can call the school at 815-882-2800, option 1.
showcase their artistic abilities. The first-place artwork will be displayed in a year-long exhibit spanning along the walls of the Cannon Tunnel, which leads to the U.S. Capitol Building. And the three runner-up pieces will be displayed in the congressman’s district offices. In addition to having their art displayed, the first-place winner will be awarded two tickets to Washington, D.C., to attend the official art show opening and a subsequent reception hosted by the Congressional Institute. The submission deadline for the 38th annual Congressional Art Competition is 5 p.m. Friday, May 3, in the Ottawa District Office. For more information on the Congressional Art Competition, call Congressman Kinzinger’s Ottawa District Office at 815-431-9271. NOW SERVING Fried Chicken every FRIDAY-SUNDAY! *Come try our NEW Hot & Spicy Fried Chicken! The Daughters of the American Revolution recently honored Josh Maubauch from Henry-Senachwine High School and Annalise Sabotta from Putnam County High School as their Good Citizen award winners during their Youth Day, sponsored by the Chief Senachwine Chapter of the NSDAR. Josh is shown with his grandmother, Vickie Brown, and mother, Tammy Maubauch. Next to Annalise is her mother, Chris Sabotta. Absent was winner Abram Pyles from Midland High School. Jay McCracken will speak at library PUTNAM — The Condit branch of the Putnam County Library will host Jay McCracken at 7 p.m. Tuesday, April 23. He will discuss the life of Putnam’s own Chief Senachwine and the different tribes that were interconnected on the west side of the river in the past. meeting, and the scholarship committee will report. Other business will include plans for the reunion to be held Aug. 3 at the Spring Valley Boat Club on Route 89. Townwide garage sales in the village of McNabb are scheduled for May 4 provide a lunch stand at the James Goldasich Community Center within the fire station, and the site will also include a bake sale and the availability of the public restrooms. The village of McNabb doesn’t have a “clean-up day” in their contract with Republic Services. Residents are able to put out bulk items every other week. Items not accepted are appliances, building materials, tires, paint, yard waste, concrete, electronics, auto or truck parts, oils or other hazardous waste. Residents should refer to the new guides they received with their new recycling carts. BIRTH ANNOUNCED Clara Mary Gerdes Nolan and Devin (Marchesi) Gerdes of Standard are the parents of a daughter, Clara Mary, born April 8 at OSF St. Francis Medical Center in Peoria. She weighed 7 pounds, 9 ounces and measured 19 inches in length. Maternal grandparents are Dale and Debbie Marchesi of Standard. Paternal grandparents are Loren and Sharon Gerdes of Gridley. MENUS Putnam County Schools Breakfast April 22 — No school. April 23 — Funnel cake or cereal, yogurt, fruit, juice, milk. April 24 — Waffle with syrup or cereal, fruit, juice, milk. April 25 — Doughnut or cereal, gogurt, fruit, juice, milk. April 26 — Cereal and toast, string cheese, fruit, juice, milk. Lunch April 22 — No school. April 23 — Ham and cheese sandwich, au gratin potatoes, green beans, peaches, milk. April 24 — No salad bar, chicken gravy over biscuit, corn, fruit, milk. April 25 — Pork fritter on bun, oven fries, applesauce, cottage cheese, milk. April 26 — Bosco breadsticks, salad, fruit, cookie, milk. School. Refreshments will be provided, and there will also be door and raffle prizes. Winners will be contacted if not present during the drawings. Putnam County Community Center April 22 — Fish sandwich with tartar sauce, macaroni and cheese, salad with toppings, banana. April 23 — Baked chicken, mashed potatoes and gravy, buttered corn, roll with butter, watermelon, dessert. April 24 — Pork chop, au gratin potatoes, baked beans, fruit cocktail, dinner roll. April 25 — Ground beef, noodles, tossed salad with toppings, garlic bread, pears, dessert. April 26 — Crab cakes on bun, tartar sauce, cheesy hash browns, Italian blend veggies, strawberries. Bread, butter, fruit juice and 2% milk are available with meals. For reservations, call 800-757-4579 24 hours in advance of the day’s meal. The suggested donation is $5 per meal. Lunch is at 11:30 a.m.
clinics every 15 minutes, games and prizes, as well as free food and drinks. Bait will be provided. Limited loaner fishing poles will also be available. Computers, Monitors, Printers, Faxes, Copiers, Laptops, TV’s, Main Frames, Peripherals, Mice, Modems, Telephones, Answering Machines, Adding Machines, Microwave Ovens, Scanners, DVD, VCR’s, Stereo Equipment, Pagers, Cell Phones, Camera’s, Camcorders, Video Games, Software, CD/DISC Books, Small Handheld Electronics, Cables, Calculators, Shredders, Scanners, Plotters and Terminals. NOT ACCEPTED: Small Kitchen Appliances, Toaster, Coffee Pots, Blenders, Air Conditioners, White Goods, Smoke Detectors, De-Humidiﬁers, Vacuum’s, Batteries, Fans, Power Tools, Light Fixtures, UPS’s, Refrigerators, Stoves, Dishwashers, Light Bulbs, Broken CRT’s, Broken Glass, Hazardous Material. LaSalle-Peru-Oglesby Junior College. In 1964, she was appointed chairman of L-P’s English department and in 1967, when the IVCC district opened, was named chair of the college’s humanities division. She resigned that chair in 1980 to return to teaching full time. Tues, April 23 from 12:30-1 p.m. No registration required. one of America’s greatest playwrights. During a 1997 interview with Mike Wood, Simon said, “‘Lost in Yonkers’ is a favorite of mine, first because I think it is the deepest play. ...” Neil Simon goes on to share how the story was built around the four main characters and how they became so incredibly dysfunctional through their stern mother’s teaching them to survive rather than to live. “Lost in Yonkers” opens on Saturday, April 27, with continued performances on Sunday, April 28; Friday, May 3; Saturday, May 4; and Sunday, May 5 at St. John’s Community Center, 1301 Second St. in Henry. Tickets for Saturday and Sunday performance are $35, which includes a meal served prior to the performance catered by The Meeting Place, featuring a buffet-style dinner, a salad bar, a dessert, coffee and three beverages. Saturday meals are Photo contributed served at 6:30 p.m. Sunday meals are Luke Bowen (from left) of Tiskilwa, as Arty, and Corbin Shaver of Lostant, as Jay, are served at 12:30 p.m. Doors open 30 minutes prior to having a ball while working hard preparing for the upcoming production of “Lost in dinner show performances. Yonkers” at River Valley Players in Henry. Friday, May 3, offers a show only option. Concessions will be avail- Arrive early to choose from an array guage and themes. able for purchase. Doors open 45 of desserts and beverages. For tickets, visit www.rvphenry. minutes prior to the performance. The show contains some adult lan- org or call 309-238-7878. Top off your Spring Cleaning to-do list by upgrading your HVAC system. Sale going on now while supplies last. Save hundreds on heating and cooling systems! IVCC’s ag program was well represented by female students, including Torino Wick (from left) of Ottawa, Lainee Day and Carly Mesarchik of Streator, McKenzie Cain of Princeton and Catie Nowakowski of Hennepin. Alumnus highlights ag open house OGLESBY — Illinois Valley Community College’s annual agriculture spring open house attracted about 25 prospective students who met with current students and heard from a program alumnus. Students from Fieldcrest, La­Moille and Putnam County high schools heard from one of the leaders of IVCC’s first class, Trent Porter of Ottawa, now a junior at Western Illinois University. Porter, IVCC’s first ag club president who also played baseball for the Eagles, is a member of the finance committee for Alpha Gamma Rho, WIU’s ag fraternity. “After two years in IVCC’s program, I was well prepared for my classes at Western,” he told the students. Porter said he has secured employment with Grainco FS of Serena this summer. Madison Boggio, Hailey Cimei, Josh Dove, Ava Hatton, Orlando Harris, Lauren Henderson, Angelina Hernandez, Nathan Husser, Ryan Kunkel, Kylee Moore, Noah Pohlson, Melissa Rosas, Bryce Smith, Jonathan Taylor and Trinity Wroblew­ ski. • Eighth grade — Blake Baker, Blake Billups, Aiden DeGroot, Wyatt Grimshaw, Ryan Hundley, Mavrick Holocker, Jadin Kierski, Katelyn Liles, Austin Mattingly, Jackson McDonald, Emma Nicoli, Joseph Pasternak, Quinn Postulla, Jesse Scott, Josiah Stunkel, Tommy Twardowski and Spencer Voss. Visitors met three of IVCC’s six ag instructors — Willard Mott, Doug Stockley and Gagan Sidhu. Mott, the full-time program coordinator and instructor, said 10 percent of all jobs in the LaSalle, Bureau and Putnam county region are ag-related. Nationally, employment opportunities in food, agriculture, renewable resources and environment are expected to increase by nearly 58,000 jobs per year through 2020. In three years, IVCC’s ag program has grown to 17 ag classes, three degrees and more than $44,000 in ag-restricted scholarships. Program facilities include a 150-acre college farm, a soils and crops wet lab, ag mechanics lab and greenhouse. For more information, contact Mott at 815-224-0413 or Willard_ mott@ivcc.edu. LASALLE — “Serve it Safely,” a twohour class that provides research-based education from the University of Illinois Extension, will be offered from 9:30 to 11:30 a.m. Saturday, April 27, at the Extension Education Center and Community Teaching Kitchen at 944 First St. in LaSalle. By attending, each participant will receive the knowledge of how to serve food safely to the public, a packet of resource materials and a certificate of completion. The class will be led by Susan Glassman, nutrition and wellness educator for the University of Illinois Extension. The program is free, and class size is limited to 30. Advance registration is required by Friday, April 19, by calling 815224-0889 or by visiting https://go.illinois. edu/servevolunteers. If you need a reasonable accommodation to participate, or need more information, contact Glassman at 815-224-0889.
insects and locating hot spots is key for prevention. This program will be offered via a live webinar at 1:30 p.m. Tuesday, April 23, at Extension offices in Princeton, Henry and Ottawa. This webinar may also be viewed from wherever someone has internet access by pre-registering at go.illinois. edu/4seasons_webinars. Auditions set for Stage 212’s production of ‘Hello, Dolly’ LASALLE — Directors Neal Phelps and Phil Grant announced auditions for Stage 212’s summer production of “Hello, Dolly” will be held at the theater, 700 First St. in LaSalle, at 6:30 p.m. Friday, April 26, and 9 a.m. Saturday, April 27. Callbacks will be at 1 p.m. Saturday, April 27. Phelps and Grant will be casting five women and four men in a variety of lead and supporting roles. They’ll also be casting a dancing ensemble and chorus, both of which will fill additional supporting roles. Those auditioning should prepare up to 30 seconds of a classic musical theater song to sing a cappella. Those auditioning for the dance ensemble should wear appropriate clothing and dance shoes/ laced sneakers. There will also be readings from the script for those interested in larger roles. These materials will be released prior to auditions. Those interested should come prepared with a list of their entire summer availability/conflicts. Auditions are open to anyone entering their freshman year of high school or older, regardless of prior theatrical experience. For more information, visit www.stage212.org or the Stage 212 audition page on Facebook. “Hello, Dolly” will be presented July 19 to Aug. 4. Day” Performance awards, and perfect scores for his “Hindemith Sonata 1” and trumpet quartet. Looking forward, he will attend Illinois State University, where he plans to major in actuarial science and participate in the University Band and Pep Band. Tickets are available through orchestra members, or at the door, for $10 for adults and $5 for students and seniors. PRIME QUARTER STEAK HOUSE • “Grill Your Own” Tonight! SPRING ON OVERTHE SHOP IS HOPPIN'! to get your Spring Decor and Easter Arrangements! Call today to per-order your Easter centerpiece. Come in and pick out your custom bouquet! Full service vice fl florist for any occasion. ABOVE: Putnam County’s Grace Ebel sends a shot for a base hit against the Midland Timberwolves last week in girls softball action. RIGHT: Putnam County shortstop Morgan Hundley grabs a line drive for the out during a PC-Midland girls softball game last week. Panthers fall to Red Devils, defeat Midland SPRING VALLEY — The Hall Red Devils scored two runs in the bottom of the fifth to go up for good in a 5-2 win over rival Putnam County in a hard-fought game April 11 at Kirby Park in Spring Valley. Cole Wozniak batted in the go-ahead run in the fifth, and Brayden DeBates followed with an RBI hit of his own to put the Red Devils up 4-2. Matt Hultz blasted a two-run shot to give the Red Devils a 2-0 lead in the second. The Panthers tied the game with two in the third inning on an RBI hit by Caleb Tonozzi and a sac fly by Dan Sabotta. Alec Bulak pitched three scoreless innings in relief of starter Payton Plym to earn the win. Trez Rybarczyk kept the Panthers silent in the seventh with two strikeouts to notch a save. Plym and DeBates led the Red Devils with two hits each. Tonozzi and Pyszka had two hits apiece for Putnam County. Putnam County 19, Midland 5: The host Timberwolves jumped out to a 4-3 lead after one inning before Putnam County’s offense exploded for five runs in the second inning, four in the third and seven in the fourth for a 19-5 10-run rule victory on April 9. Dan Sabotta led the way (3 hits, 4 RBI), with ample help from Nolan Whitney (2 hits), Luke Olson (2 hits, 3 RBI), Caleb Tonozzi (2 hits, 2 RBI), and Jakob Pyszka (1 hit, 4 RBI). Brayden Holmes added a hit, three walks and scored 4 runs. Sabotta, pitching 2.1 innings, earned the victory in relief of starter Chance Mayers and reliever Max Magana. A short flip from the Panthers’ Brayden Holmes to Jakob Pyszka, then a toss to Luke Carlson on first base, and Putnam County had a double play against Midland. Putnam County’s Luke Olson connects against Midland. Olson had two hits and three RBIs as the Putnam County Panthers prevailed, 19-5. Wizards to play in Mendota MENDOTA — The Harlem Wizards will play at Mendota High School on Wednesday, May 1, at 6:30 p.m., guests of Karl’s Krusaders. The world-famous Harlem Wizards is a basketball team that provides a world-class, laugh-aminute, high-flying, and interactive family-oriented show on the basketball court. The Wizards’ opponents for the game will be local teachers and recognizable people from the community. On game day, the Harlem Wizards will have school assemblies at Mendota elementary schools. These motivational assemblies will focus on the message of teamwork, perseverance, sportsmanship, health and fitness for all of area youths. Tickets are on sale at www.harlemwizards.com and at Sports-N-Stuff in Mendota. a.m., rain or shine, Monday, May 27, at the Streator YMCA at 710 Oakley Ave., Streator. Entry fee is $20 for runners and $15 for walkers if participants preregister, and $25/$20 on race day. Check-in times for the race will begin at 6:30 a.m. and conclude by 7:45 a.m. For more information, contact the race director at j.biros@streatorymca.org or 815-672-2148 or visit www.streatorymca. org. Dad’s Day 5K MENDOTA — The 2019 Father’s Day 5K will start at 8 a.m. Sunday, June 16, at Strous Park in Mendota. Entry fee is $25 by June 8 and $30 after. Check-in will begin at 7 a.m. Registration may be done online at www.signmeup.com/129548. SPORTS SHORTS Bureau Valley 5K color run MANLIUS — The Bureau Valley 5K Color Run will be at 9 a.m. Saturday, April 20, at the Manlius Park, Second Street in Manlius. Race day registration is $25, extra shirts are limited. All proceeds will be donated to St. Jude Children’s Hospital. All ages are welcome. St. Margaret’s Habit for Health SPRING VALLEY — St. Margaret’s 10K and 3-mile Fun Run/Walk is set for 8 a.m. Saturday, April 27, starting from St. Margaret’s Family Health Center at 415 E. Second St., Spring Valley. Race day registration and packet pickup will be from 7 to 7:50 a.m. in the west pavilion parking lot. For more information, contact Gina Mudge at 815-3789726 or gcmudge@gmail.com, or visit www.about.smh.org or SMH Facebook. SPORTS | Putnam County Record / putnamcountyrecord.com • Wednesday, April 17, 2019 ABOVE: Putnam County senior Kaleb Wright won the discus competition at Saturday’s Rollie Morris Invite at Hall High School by more than 21 feet with a throw of 146-6. The Panthers finished sixth (41) as a team in the 10-team field. FOR MORE INFORMATION, CONTACT US AT unclaimedproperty@illinoistreasurer.gov or 877-581-3689. The Bureau, Putnam and Marshall County Health Departments are accepting application for a Public Health Nurse opening. We are seeking a Registered Nurse (RN) to work primarily out of our Marshall County Health Departments. Ability to travel to Bureau or Putnam will be required. The job will encompass providing the following services: WIC (Women, Infants and Children) program, Family Case Management program, Immunization, Communicable Disease investigations and general Public Health Nursing. A Bachelors Degree in nursing is preferred. Please direct all applications to Bureau County Health Department: Attn: Hector M Gomez 526 S Bureau Valley Pkwy, Princeton, IL 61356. We offer a large variety of materials for all your landscape needs. Pick-up or delivery are available. No baloney with Al Cioni! Mounting, Balancing, Rotating, Patches, Plugs and all tire repairs plus Small Implement Farm Tires Now accepting all major credit cards! We Have A Great Selection Of Floor Coverings To Meet Your Every Need! Shop these area businesses and see how they can help you with your various needs! ADVERTISE YOUR SERVICES RIGHT HERE! trusted installers. Licensed and insured. We are the READER’S CHOICE for #1 PLUMBER! A Division of Ed Hartwig Trucking & Excavating, Inc. The perfect way to discard old roofing materials. Take a fresh look at the Classifieds, the original way to shop green! students and police officers are all welcome to attend to learn about our program, the different fields within criminal justice and changes to the program. “Criminal justice goes beyond the squad car. From court reporting to private security to community relations, there’s something for everyone to better serve the community,” he said. RSVP at www.ivcc.edu/events or call Hermes for more information at 815-224-0491. OPEN EASTER DAY FROM 8A.M. TILL NOON!!! !